International Journal of Research in Health Sciences,2014,2,4,953-961. 1,2,3-Department of Ear, Nose and Throat, Head and Neck Surgery, Faculty of Medicine, Hasanuddin University / Wahidin Sudirohusodo Hospital, Makassar, INDONESIA. Introduction: The tympanic membrane plays an important role in the physiology of hearing. If perforation occurs, the hearing power will decrease. Role of perforation closure operation results are still not satisfactory. Latest knowledge about stem cells as the cells was able to differentiate into other cells to produce a new treatment expectation in handling perforation. Method: The aim of this research was to assess the role of bone marrow stem cells in the healing of marmot tympanic membrane perforation. The number of sample were totaling 22 marmots that were divided into three groups, group I amounted to 8 marmots, in group II were 7 marmots and in group III were 7 marmots. All marmots with chronic perforations made in the tympanic membrane perforator then injected with Staphylococcus aureus bacteria taken from microbiology section at tympanic cavum. When there has been a chronic perforation and declared dry, the group I taped marmot bone of marrow stem cells, amnion membrane attached to group II, group III as the control (without treatment). Results: There was no significant difference between the mean of age of the sample in the three groups (p> 0.05) and also no significant difference in mean body weight among the samples into three groups (p> 0.05). 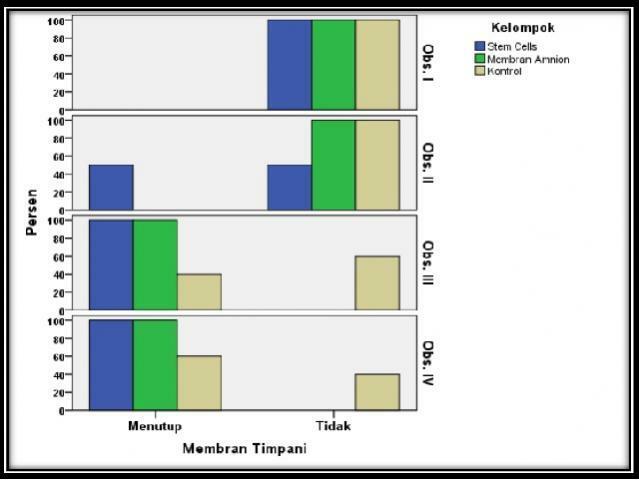 In the first observation of perforation, closure has not occurred among the three groups yet, on the second observation there were significant differences according to the percentage of the tympanic membrane closure group (p <0.05) in which groups of stem cells, it closures on 3 samples (50%) than other groups. In the third observation there were significant differences in the percentage cover of amnion membrane according to group (p <0.05). In the group of stem cell and amnion membrane, the closure occurs each 6 (100%) and 5 samples (100%), whereas in the control group the closure of the tympanic membrane occurred in 2 samples (40%). Conclusion: The role of bone marrow stem cells as the cells that are able to differentiate into other cell can be covered perforation of the tympanic membrane was faster than using amniotic membrane closure and control groups.